Six features to look for in your next running shoe, along with five shoe-buying mistakes that you must avoid. Finding the best-fitting shoe among the many choices at your local running shop isn’t always easy. To ensure you walk out with happy feet, you need to make sure the shoe fits properly from heel to toe. We asked two prominent speciality-running-shop owners – each of whom has fitted thousands of runners – to share some of their secrets. Knowing what to look for will give you a better idea how your next pair should feel on your feet. Your heel should fit snug, but not tight, says Carl Brandt. “Laced up (but not tied), you should be able to slide your feet out.” Lacing your shoes up through the final eyelet minimises slippage. There will be some heel movement, but it shouldn’t be uncomfortable. Any irritation you feel in the store, adds Brandt, will be amplified once you hit the road. 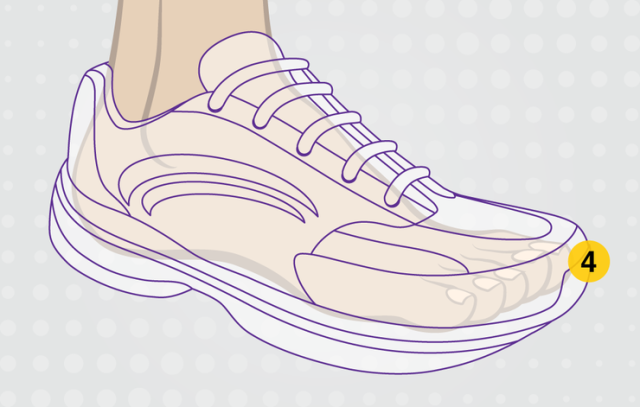 A shoe’s upper should feel snug and secure around your instep, explains Brandt. 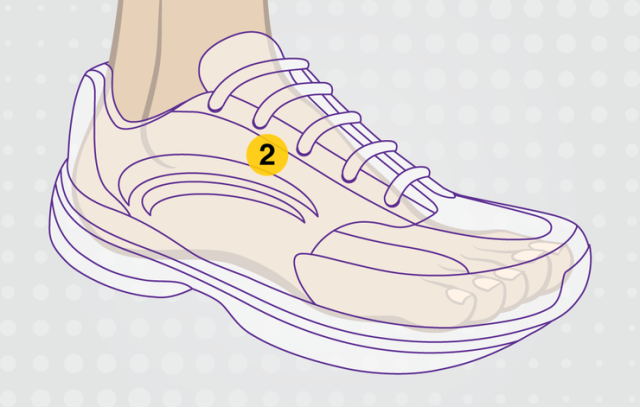 “When people tell me they feel pressure and tightness, they need more space.” If an otherwise great shoe has hot spots or pressure under the laces, try some alternative lacing techniques before moving on to the next shoe. Your foot should be able to move side-to-side in the shoe’s forefoot without crossing over the edge of the insole, says James. You should be able to pinch half a centimetre of upper material along the widest part of your foot. 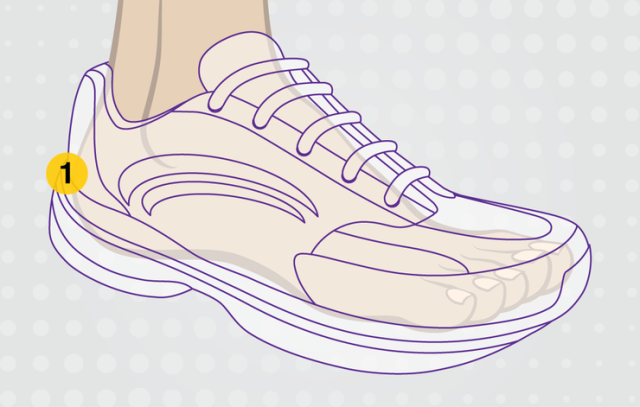 If the shoe is too narrow, you’ll feel the base of your little toe sitting on the edge of the shoe last. Check the flex point before you put on the shoe, suggests Carl Brandt, owner of Movin Shoes running stores. 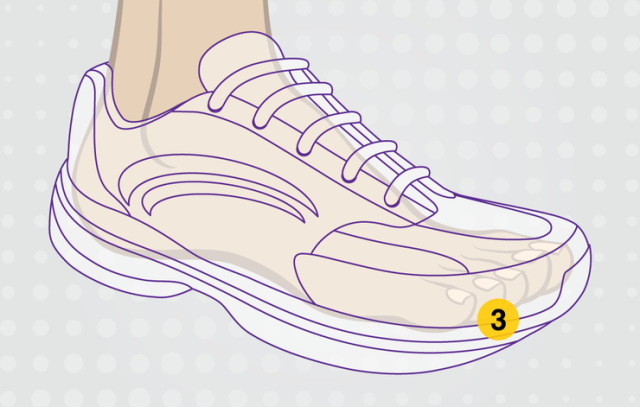 You can do this by holding the heel and pressing the tip of the shoe into the floor. 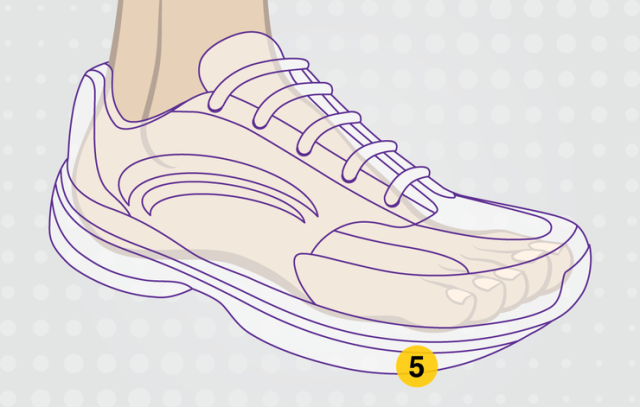 The shoe should bend and crease along the same line your foot flexes. An improperly aligned flex point can lead to arch pain or plantar fasciitis, while a lack of flexibility leads to Achilles-tendon or calf strain. Knowing your arch type or running mechanics isn’t the whole story. 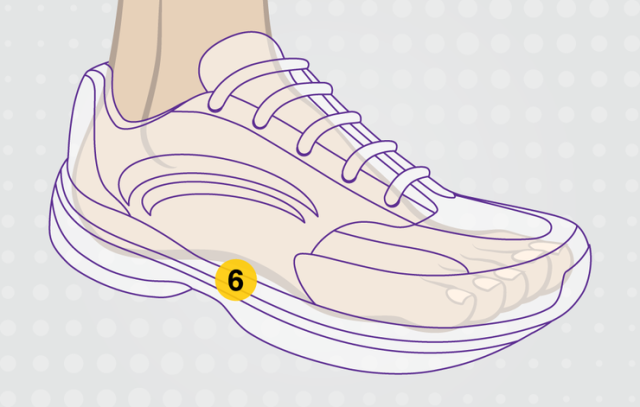 You still need to pinpoint shoes that match your foot’s contours and movements. You can’t get a good feel by just standing, says James. So take your shoes for a quick jog, either on a store’s treadmill, on the sidewalk, or down a hallway. A natural-feeling support under the arch works for most people, James says. “Back off the amount of support if you feel your arch cramping.” Your shoe should complement and support your stride, not try to alter it.